Elevation elation is the natural high in Bogota, Colombia. While not at the top of many wish lists, it will surely climb higher, in spite of recent antics in coastal Cartagena. PGA star Camilo Villegas has put Colombia back on the map attracting positive attention. The Nationwide tour is also elevating in status as the qualifying mechanism for very strong players to move up or return to the PGA tour. Its first tournament of the year played out at The Country Club of Bogota, garnering much media with the participation of Ex-President Bill Clinton. He kicked off the pro-am with a vicious duck hook. Yes, Democrats, it went far left. His second shot was a good recovery and he escaped with his service team unscathed by scandals. Walking and biking keep people healthy and out of traffic congestion. Hiring a driver for distance is the best way to commute and view the sights of this magnificent city with over 8 million inhabitants. Garage type doors open to the street revealing the meat market, shoe shop, bakery, and beauty salon all in a row. A side street turn bec omes a long path past a polo ranch and suddenly, San Andres Country Club pops up like Grand Central Park, where a Gran Telenovela (soap opera) was being filmed. The Robert Trent Jones, Sr. course is parkland style with no evidence of the surrounding city. The spa like aroma of the tall eucalyptus and cedar trees wafts through the air. The fairways are green, greens are fast and like all courses there, everyone walks. Caddies carry bags, rake bunkers and disclose course secrets. After nine beautiful holes, we were invited for “refrigerio.” No dog at the turn here, rather scrumptious entrees and exotic fruit juices for the standard ten minute break. It is ok to leave food on the plate or you couldn’t swing on the tenth tee, however it is not easy to resist every bite of the fresh and flavorful Colombian cuisine. Rincon Golf Club of Cajica was flooded last year but restored to playability with RTJ Jr. redesigning larger water features and drainage for future protection. The filet mignon for lunch matches Ruth’s Chris. Golf courses are private but tour companies book exceptions for travelers. 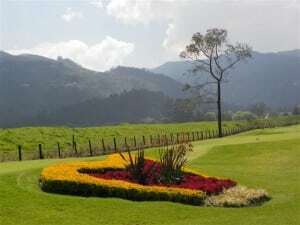 Www.colombia.travel.com will make all arrangements. Request Ron Garl’s redesigned Club Guaymaral where special attention is paid to brilliant horticulture. We never expected the altiplano of the Andes to be so tropical, yet more flowers are exported from Colombia than anywhere except Holland. The elegant facilities, finest chefs and equestria n center create an elitist country club at Guaymaral. Play golf in the morning; tour in the afternoon. 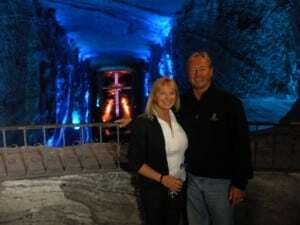 Contrasting the 8600 feet altitude of Bogota, journey to the center of the earth, or at least 280 feet below to The Salt Cathedral where Stations of the Cross are carved into the cavern. Brides are carried down by cart while the groom walks the long path symbolizing the burden he is about to bear. Funny sentiment but the incredible sculptures and lighting are inspirational. So too are the Pre Colombian artifacts at the Gold Museum in the Calendaria district. Architecture in the presidential plaza invokes an impulse to call your high school Spanish teacher. Ride the cable car to the monastery of Montserrate for exquisite dining above the city lights. Forget resorts but enjoy the Grand House with a small lobby, large rooms and ultimate showers, just a short walk to Parque 93 where families frolic, promenade and dine. A high rise hotel served as a prank driving range for Notah Begay and associates, teeing off to a turf mat in the park. Don’t try this at home as lawyers would line up for errant shots. Save La Cima Golf Club, the second highest course in the world at over 10,000 feet, for last when your body is well adjusted to the altitude. You don’t have to tee it high to let it fly. Enjoy the distance and panoramic views of farms, lakes and the Andes Mountains. 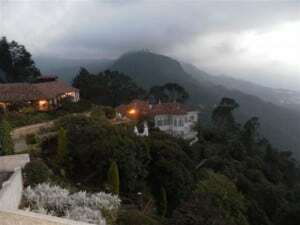 The Colombian tourism slogan is “The only risk is in wanting to stay.” Caution is required anywhere we travel but indeed many Americans move to Bogota after falling in love with the climate, cuisine and culture. Wake up and smell the Colombian coffee. It’s not just about romancing the stone. Though the emeralds make great souvenirs, lifetime memories are an even richer keepsake. Use common sense that the secret service didn’t and you’ll be on top of the world.